Spring Open Studios 2018 features student art work in a variety of media including: drawing, painting, print media, sculpture, intermedia, photography and electronic art. Come to the UCSC Art Department on Friday June 8th, 2018 to see the Art students' artworks! Wrapping up fall, winter and spring quarters, the UC Santa Cruz Art Department transforms during its Spring quarter Open Studios event into an explosion of shapes, colors, and meanings when students exhibit work inside and outside at the Elena Baskin Visual Arts Center. Always impressive, this display of drawing, painting, print media, sculpture, intermedia, photography and electronic art is a free event open to the public. Students, faculty and staff from all over campus, as well as people from the greater community, visit for enjoyment and thought-provoking inspiration. This is a great opportunity not only to enjoy art but also to meet the artists, make connections, discuss processes and philosophies, and perhaps learn something in a fun way. If you have ever wondered what UC Santa Cruz art students do, this is your chance to come see for yourself! 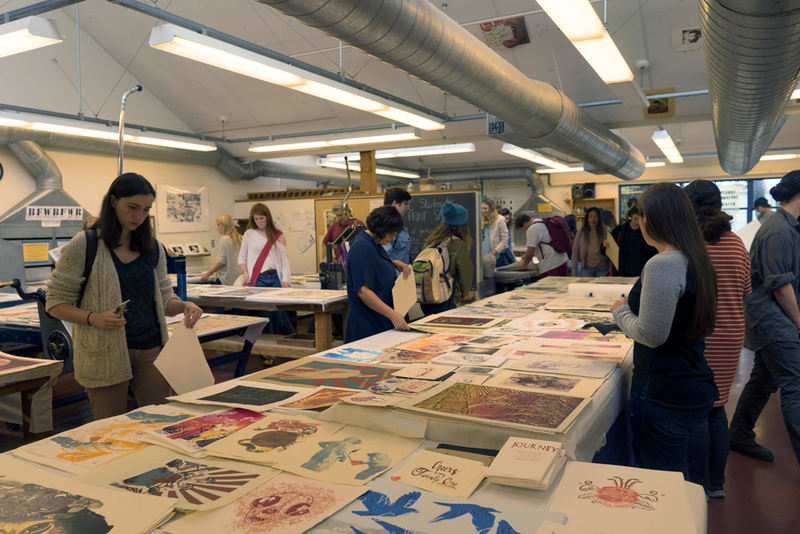 Spring Open Studios especially shines as students show the best of their work from the entire year and visitors may also attend the fabulous, ever-popular annual Student Print Sale (more on the print sale below). The event is free and open to the public. Parking is available at the performing arts parking lot using the self service kiosks ($2.25 per hour with a 2 hour limit) or you can get a day permit at the entrance to campus for $9. Friday parking attendants will be selling parking permits at the performing arts parking lot. This annual event attracts people from all over campus and the greater Monterey Bay community. Print Media students get to sell their original artwork and the community gets to support budding artists while collecting beautiful art. Now that’s a win-win opportunity! Hundreds of original etchings, lithographs, woodcuts, digital prints, handmade books, and more will be on display and available for purchase at extremely reasonable prices. This is a unique opportunity to see and purchase high quality hand-made artwork, meet the artists and tour the exceptional art facilities at UCSC. Profits directly benefit the student artists and the UC Santa Cruz Printmaking Program. The sale can accept CASH & CHECKS ONLY (sorry, no credit cards). The event is free and open to the public. Parking is available at the performing arts parking lot using the self service kiosks ($2.25 per hour with a 2 hour limit) or you can get a day permit at the entrance to campus for $9. Friday parking attendants will be selling parking permits at the performing arts parking lot and Saturday parking is available using the self service kiosks.